Some friends and I are doing a guys camping/riding Friday Nov 1- sat nov 2. Probably getting there afternoon on friday and camping out. Riding saturday until we get tired and leave. 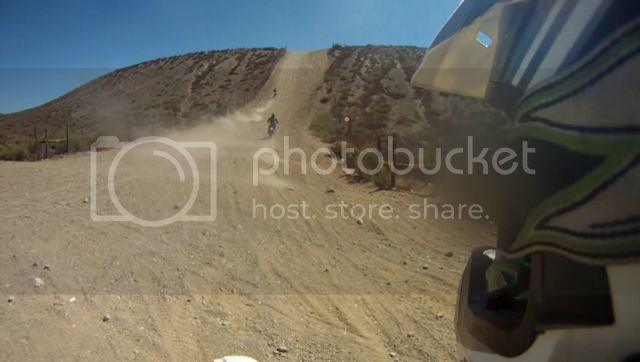 Camping in Hungry valley, its a OHV, so you dont need a plate, but you do need a spark arrester. Someone in my group is bringing out a quad, so quads are welcome. More details will be available if anyone is interested. What city's the truck coming from? Room on it for the DR? The freeway is BRUTAL on the little 350 single. working friday, then having guest over Saturday/Sunday or else I'd make it! Mud, this sounds like fun. Are you guys riding in? I have a questions about on/off road tires: Are you running something like this? If so, how are they on/off road? hmmm, is there a lot of enforcement out there for the spark arrestors? Great place to ride, a lot of fun out there. As for spark arrestors and the rangers, the last time I went up, the lady at the gate asked if we had spark arrestors but never checked to see if we actually did. Past the gate, we only saw one ranger go by, and that was about half way through the day. 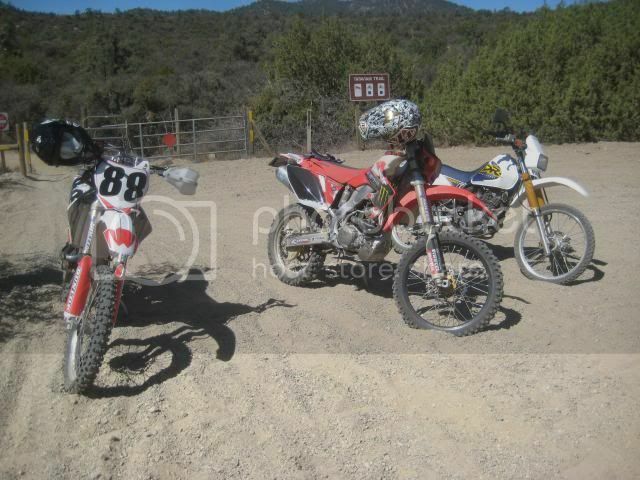 They check th Mx bikes pretty close I wouldn't risk it, I don't have a sticker or arrester so I'm stuck in the desert! We are trucking it out there. No need to waste knobbies on the freeway. Really? I must have had a lazy ranger then. I wouldn't risk it either, I have a spark arrestor in mine so I never worry, just found it nice that the ranger at the gate didn't even bother to question us. Maybe it had to do with us going on a week day instead of a weekend. Depends on what your riding, They know what to look for If your on a plated bike they just keep going but old or race looking Mx bikes will get rolled on My buddie even got a ticket for speeding on the road that goes back to Alamo mountain! '97 CR250R with FMF full system and replaced plastics from when it was supercrossed. Like I said, I must have been lucky. I'm green stickered anyways so it's not like they can tell me to go away. This Friday I'll be heading to silverwood which is a load of fun as well. Want some company on Friday? Sorry to thread jack but Im wide open Friday!!!! Working Graveyard in Apple Valley that night and will be done and ready to ride by 9:30 ... IN! Ok so my friend and I are leaving sometimes friday. Depends what we do thursday night (haloween). Get out there early afternoon hopefully. I have another friend getting off work and coming out with his quad. Later friday. We are going to camp/fire/drink friday night and go riding sat morning. We are going to camp at lower scrub oaks campground. That is a map but they give you one when you enter the park. I think its 10 bucks a night per vehicle to camp. I'm not always an assh*le... Just kidding go f*ck yourself. Chris in regards to tires get Trials tires they hook up great on everything but deep loose sand. I've taken them in the canyons on the street and lots of off road. really good for hard fire roads with thin layer of loose dirt on top. Life is not a journey to the grave with the intention of arriving safely in one pretty well-preserved piece. One should rather skid in broadside thoroughly used up, totally worn out and loudly proclaiming "WOW, what a ride"!!! Had a blast, camping was fun and we got 2 good days of riding in.